"Thanks for the kiss" "Thanks for the kiss"
The above info came from Renee Rithrande, and was edited by yours truly (contact me). 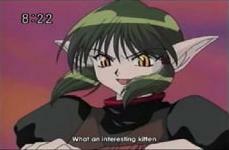 The image came from Tokyo Mew Mew. Kish controls the alien parasites that turn into Kirema Animas. He is very complex, to say the least. When he first comes in he gives Ichigo a forceful kiss, and then says, "Thanks for the kiss." He keeps harassing Ichigo, and even calls her honey and kitty cat. The first time you really see Kish is at the very end of the episode in which she finds the third Mew Mew. He is sort of seen before that, in the second episode, but only his eyes were shown, so that doesn't really count. The above description came from Renee Rithrande, and was edited by yours truly (contact me). Kish's main goal was to save his people who were dying from lack of food, water, and shelter (basically everything). But it seems later that he stopped caring about his people, and instead cared more about Ichigo. He would do anything to gain Ichigo's love, and he even tried several times to kill her crush, Aoyama Masaya. He sometimes wonders if Deep Blue is even trustworthy of saving their planet, and is more confident in his own orders then Deep Blue's. The above description came from Jessica Chang, and was edited by yours truly (contact me).